I have rules. I don’t have very many; there are just four that I go by every time I shoot. In part these rules keep my mind on what I should be doing and no pun intended, keep me focused. Today’s blog is only going to talk about rule #1, the rest will come in time, but let’s not get too far ahead of ourselves. Rule #1 – you truly have to understand your sport! There are moments of power and moments of grace that show the beauty and elegance of sport and then, well then there are transitional moments that no one needs to see. Personally, I believe that it is my job to make the athletes look good and I promise each athlete that I will never put up a shot that makes them look bad. If they happen to collapse at the end of the event, that is part of the sport and it displays the intensity of their effort. Similarly if there is a bike crash and they are back up and riding, ripped race kit and road rash, again it is about their dedication and perseverance. However if they have a wardrobe malfunction, I will not include that it. I am sure others would, but that is just not my style. At least a basic understanding of the biomechanics of each particular sport is critical in making the athlete look good. Perhaps the easiest sport to articulate the importance of understanding biomechanics is running, since about three times the athlete’s body weight is transmitted to their feet each time their foot strikes the ground. The force of the impact has a visible distortion of the leanest runner’s body. The good news is the today’s high frame rate cameras and our ability to shoot in burst of several shots, the odds of getting just the right shot are dramatically increased, that is provided that we can identify that shot when we see it! Here are a few examples of the difference a 1/10 a second will make. The first two shots are of my friend Daniel. Daniel in addition to being a great guy is an elite amateur triathlete. In the first shot, Daniel is at the top of his stride, shoulders are up and he is smiling! In the second shot, Daniel is at the point of the full impact of his weight and while his left quad shows strength everything else has succumbed to the natural weight transfer inherent in running. Just looking at Daniel, you can see his legs have the power of a cyclist, on the other hand we also have pure runners. 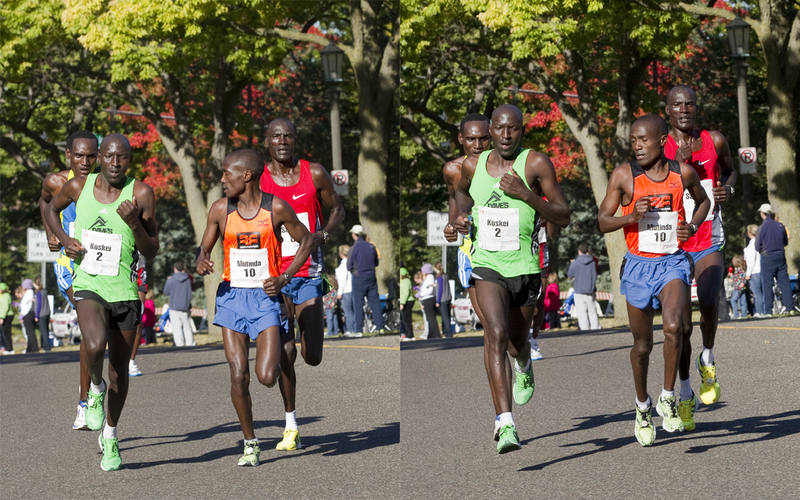 The lead pack of the 2011 Medtronic Twin Cities Marathon is at about the 23-mile mark in the race. In the left image as small and lean as Joseph Mutinda (#10) is, you can still see how his shoulders slope at the bottom of his stride. 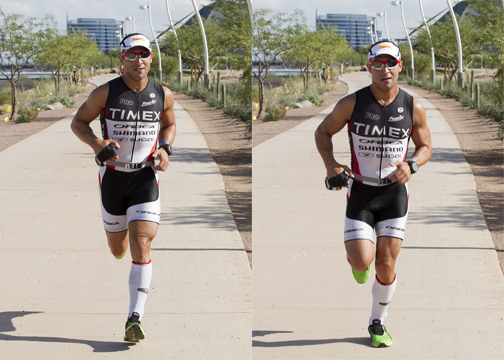 In the right image, where his right toe is just about to lift off the ground, he looks relaxed and light. (Mutinda was ultimately second to Sammy Malakwen, in the red). Malakwen made his move in the next mile and cruised on in for the victory. I don’t shoot baseball very often and in this situation I was there as a guest. Contrary to my rule #1, I really don’t know a lot about the subtleties of baseball, but I do know that Wrigley Field on a sunny day in May is about as good as it gets. Here are three images, the wind up, the pitch and well, an awkward moment in the follow through. For me, the first two images are classic positioning. The concentration and poise of the wind up, the pitcher’s potential energy. The second image is moment of full power, and although the final shot does show the ball just after release, the pitcher’s position is one of those transitional moments that neither displays his skill nor his power. We have the ability to shoot huge numbers of images and carefully select only those images that best tell the story – choose wisely! Check back soon for our next post – We Need a Cover Shot – You’ve Got 20 Minutes! This entry was posted in Running, Sports Photography by competitiveimage. Bookmark the permalink.